Federal Way Women's Health Care (Federal Way) - Book Appointment Online! 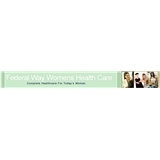 Federal Way Womens Health Care provides complete health care for today's woman. Our physicians specialize in the health care needs for women in every phase of life, from adolescence, through the childbearing years, menopause and beyond. Our support staff is trained to help you access your physician and make your experience at our clinic pleasant and informative. We are continually educated on the latest development in obstetrics and gynecology and we use current technology that benefits today's woman.